SEOUL, South Korea -- Buddhist leaders on Thursday reacted angrily to President Lee Myung-bak over a controversial police search of the vehicle of their head monk, demanding the Christian leader fire his police chief and stop his "religious partiality." 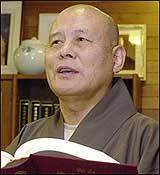 Lee, an elder in a powerful presbyterian church in central Seoul, has become deeply unpopular with Buddhists following a series of government policies that they say are religiously discriminative. The discontent compelled Prime Minister Han Seung-soo to officially apologize last week. The rift took a fresh turn, however, after Venerable Jigwan, the chief executive of the Jogye order, South Korea's largest Buddhism sect, encountered an embarrassing inspection inside the Jogye Temple grounds, central Seoul. Ven. Jigwan was departing for an outside meeting on Tuesday when police officers stopped the car. The monk rolled down the window and showed his face, but two officers, aware of his status, opened the car's trunk and continued their search efforts. The temple has been under police supervision for about a month since six civic activists took refuge there as they were wanted by police for allegedly organizing street protests against U.S. beef imports. "They treated Ven. Jigwan, who represents 20 million Buddhists, like a criminal, and this incident revealed how police see the Buddhist circles and that they are treating the Buddhist history with contempt," Monk Seungwon, the Jogye Order spokesman, told reporters. Massive protests ensued, with some shaving their heads and hundreds holding a protest service to ouster Eo Cheong-soo, chief of the National Police Agency. Eo tried to visit Ven. Jigwan to apologize, but his meeting request was rejected. The police chief has also been under criticism for the use of excessive force against U.S. beef protesters. Opposition parties condemned the incident, demanding Lee apologize. "It is an unbelievable thing to happen," Chung Sye-kyun, chairman of the major opposition Democratic Party, said in a party meeting. "Mr. Eo should be immediately dismissed and President Lee should kneel down and repent." Lee's trouble with Buddhists spans through his political career. His controversial remark as a Seoul mayor in an evangelist gathering -- "I am dedicating Seoul to God" and his congratulatory message during the presidential campaign to Christians who prayed for "temples to fall down" infuriated Buddhists as well as non-faithfuls and critical Christians. His church network played a major role in his first Cabinet and was equally criticized for policy blunders. Finance Minister Kang Man-soo is Lee's long-time fellow member of the Somang Presbyterian Church, and survived a recent reshuffle despite intense criticism for his failure to provide a consistent currency policy. Another Somang member, Park Mee-sok, the senior secretary for social policy, was forced to resign after media reports revealed her alleged land speculation. Earlier this year, the Ministry of Land, Transport and Maritime Affairs came under fire for omitting popular popular Buddhist temples in its traffic information guide, which detailed Christian churches.